The Bakony Forest, or as generally called Bakony, is a range of dolomite karst occupying a territory of 4,000 square kilometres. Lying in the west part of the Transdanubian Mountains, it is the largest region of the range and an ideal place for bicycle tours. Being located in Bakony, Hotel Hasik is prepared for providing for bike tourism, too. 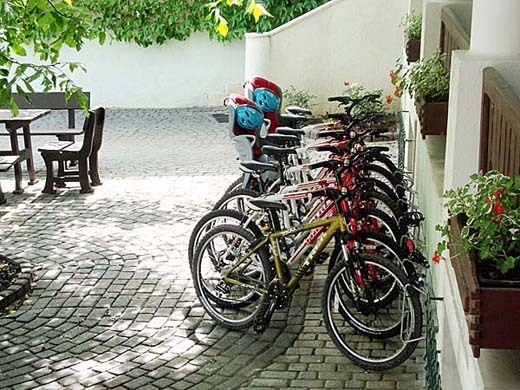 The hotel has a range of excellent quality Trek brand mountain bikes for a fee at the disposal of those who prefer active tourism and outdoor trainings. Our guests can discover the beauties of the landscape around Döbrönte while riding these bikes. We recommend the bicycle tours to anyone who would like to make a tour in this nice environment. Most of the paths are free of road transport and take a whole day to cover. Tiredness – in a positive sense - at the end of the tour is guaranteed. Középső-Hajag lies less than 15 kilometres, while Öreg-Futóné is less than 30 kilometres from Döbrönte. For more trained bikers, Kőris-hely lying beyond and above Bakonybél is an excellent target. Being the highest point in Bakony, to reach the peak both on foot and by bike generates a feel of satisfaction. For those setting off for a longer ride, the kitchen staff at the hotel can prepare cold meal packages on request. Of course, on return to the hotel, our guests can expect some excellent hot meal in the hotel restaurant. One of the great advantages of going by bike is that there is plenty of opportunity of detours and a stop on impulse doesn’t require a built parking place for the bikers. They can leave their bikes around anywhere in nature. Last but not least, the bicycle is an environmentally-friendly transport vehicle, which is a very important factor in this majestic place. So we can discover surroundings with clear lungs and a clear conscious. On the majority of the roads in Bakony transport is scarce or relatively little. However, if you want to use the following roads by bike, you should be highly precautious since they are major routes: Main road 8: avoid by bike if possible since it has considerable road transport (including cars, tracks and lorries). Main road 82: transport is heavy mainly in summer, it is suitable for bike tours in spring and autumn. Main road 83: averagely heavy traffic. Using motorways and main roads always require bikers to think ahead in a precautious way! There are only a few places in Bakony approachable on asphalted road which are over 500 metres sea level. As the surroundings of these places also typically lie at a similar height, long and steep slopes are rare. Therefore, bicycle tours in Bakony are typically set in hilly surroundings with a lot of curves, ups and downs. The quality of most paved roads in Bakony is satisfactory. Therefore if you choose to ride on these roads, no major deficiencies are expected. Phases with a lot of bumps or rough surface are rare, except for routes used for agricultural purposes or roads with scarce traffic. The climate within Bakony varies considerably. On the north-west part of the hills, it is oceanic with a considerably wet and cool summer. However, in the south west and in the east you can expect much more sunny hours and a lot of dry periods. Due to this changeable, peculiar climate, it is advisable to dress suitably for the bicycle tours.